Different mega projects being executed under China Pakistan Economic Corridor (CPEC) should be expedited so as the people can reap the fruits of the development at the earliest. Completion of the projects for provision of clean drinking water, health care facilities, vocational training and sports infrastructure on priority basis is of vital importance for the province of Balochistan. 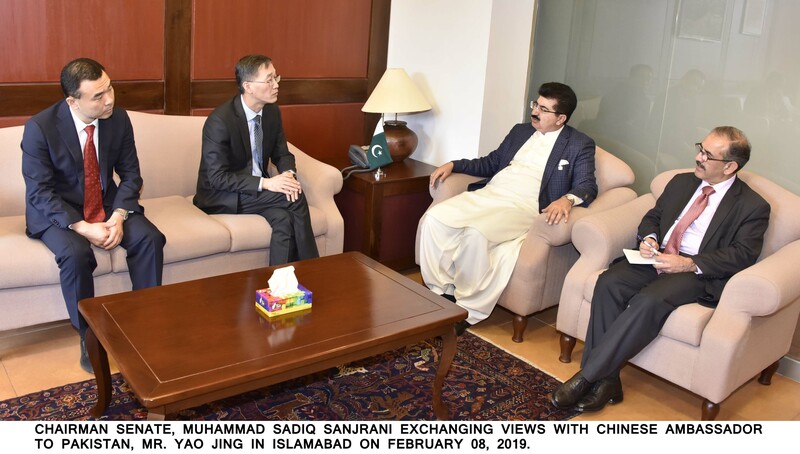 Chairman Senate Muhammad Sadiq Sanjrani said this while talking to Ambassador of China Yao Jing, here on Friday. Chief Secretary Balochistan Dr. Muhammad Nazir was also present during the meeting. Chairman Senate said that historic friendly ties between Pakistan and China have further strengthened due to enhanced economic cooperation between the two countries. Projects under CPEC are not only for the benefit of people of Balochistan but also very important for economic development of different areas of the country as well as providing a mile stone for future development of China. Sadiq Sanjrani said that provision of quality health and education facilities would raise the standard of living of people of Balochistan. He said that keeping in view, the increasing requirement of health sector in the province, a hospital of international standard in Balochistan should be setup in addition to provision of added health care facilities to the people. He said that the province is offering optimal investment opportunities due to ongoing development process in the province and there is a huge potential for the investment in fisheries sector. Chairman Senate said that other less developed areas of the country should also be included in the development stream to provide better facilities at par with the developed areas. He said that there is a need to offer special scholarships for the students of Balochistan with the cooperation of Chinese government. Provincial government may provide these scholarships to the students of all the districts of province purely on merit so as to improve the standard of education especially in the neglected areas. Chairman Senate was apprised that as a part of the sport infrastructure development process in Balochistan, the first football stadium would constructed in Quetta. He was also informed that different projects are being planned for less developed areas of the country with close collaboration of Chinese government and ministry of Planning and Development.